Re-imagine leading and following in a world longing for true justice, compassion and freedom followers of Christ yearn to see the world changed in compassionate, positive, effective ways. As prophetic voices, Shane Claiborne and John Perkins lead the way in this move to be the hands, feet and heart of Jesus. One is young, a self proclaimed reformed redneck who grew up in the hills of Tennessee and now lives in inner city Philadelphia and the other is decades older, an African-American civil rights leader who was almost beaten to death by police in Mississippi, and went on to found a reconciliation movement and counsel three American presidents. Claiborne and Perkins draw on more than a century of combined following and learning, activating and leading. Together they craft a timely message for ordinary people willing to take radical steps to see real change happen. 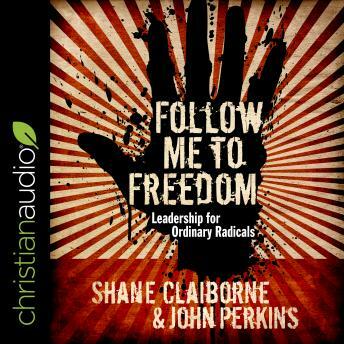 In Follow Me to Freedom, Claiborne and Perkins lead the way toward justice for all, unfolding a proven strategy as ancient as the patriarchs of faith and as fresh as the needs of every human heart. Starting with Moses as a model, they re-imagine leading and following in a world desperate for true social justice, compassion and freedom. They offer practical ways to internalize and live out God’s promise of freedom in the twenty-first century. Followers of Christ will not only be inspired but also catalyzed into action, and the world will never be the same.